Doesn't he ever get sick of being slapped around? Tomorrow is RPI's 31st annual Big Red Freakout. 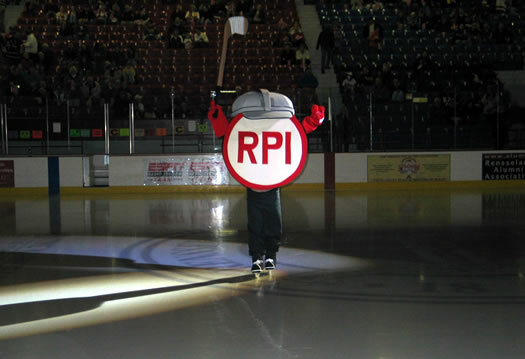 So on the eve of the institute's biggest hockey game of the year, AOA got an exclusive interview with the RPI mascot, Puckman. So Puckman, is there anything special you do to prepare for freakout? I try to get as much rest as possible during the day because there are a lot of fans - young and old - who will want high-fives from me. The good news is that I won't need to work too hard to get the fans going because the place is rockin' on its own! As a puck, do you ever get tired of getting slapped around? Just one of these days I would like to end up in the net as the game-winning goal instead of just revving up the crowd. As you might imagine, all the glory is on the ice! From the questionnaire our mentor James Lipton ripped off from his mentor Bernard Pivot and Bernard Pivot ripped off from his mentor Proust: What sound or noise do you hate?